This picture was taken at the same time as the one at Jewfish Creek bridge. The view here is Southerly looking towards the Gulf of Mexico over the Jewfish Creek. That is the body of water between the the island that Key Largo is on and Jewfish in Monroe County. If you see the map of the area it is just at the south end of an 18 or so mile long causeway. Either side of that causeway is lined with Mangrove trees and other scrub trees that can grow in the Saline soil there. 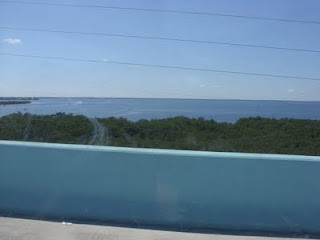 This is where you cross into the area that is like no other, The Florida Keys.